The first key to securing pupillage is knowledge. Knowing what you need to put on your CV. Working out how to get those things on your CV. Now, there are a ton of websites which explain to students how to get things onto their CVs, so those kinds of topics are not addressed in this guide. While this is the profile of a typical applicant, ultimately it is what you do with what you have that counts. You will need to use your experiences to show that you have what it takes to become a barrister. However, you won’t get very far without most, if not all, of these things on your CV – you will simply be underwhelming in comparison to other candidates. NB: “Magic circle” Chancery/commercial sets are even more selective and require an even more accomplished profile than the above. You’re so wrong, my friend got pupillage without an Inn scholarship! My friends are split 60/40 on Inn scholarships. All succeeded. However, each year approx. 400 BPTC Inn scholarships are given out. There are fewer than 450 pupillage spots across the country. You do the maths. Another got pupillage by interning abroad! The set in question probably wanted that specific kind of experience. Interning abroad is nice but it is not essential for success. My friend paralegalled for three years and they were successful! So did my friend. Paralegal work is good experience to have, but it doesn’t guarantee success. 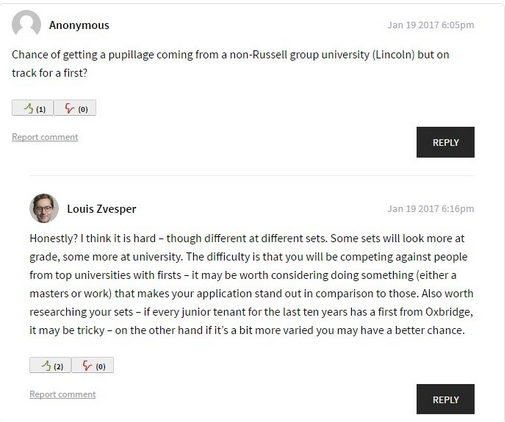 Given the choice, pretty much all candidates would choose to get pupillage earlier rather than later. Bottom line: the more things you have on your CV earlier on, the better your chances. Hugely impressive. You’re in a different league from the rest of us. That doesn’t, however, make the advice wrong; it makes you an exception. You are exceptional. I don’t have some of these things on my CV. Are you telling me to give up? No. But you HAVE to be realistic about your chances. There are candidates who have obtained pupillage with a less-than-stellar CV. However, the reality is that my peers and I had most of these things on our CVs before we started the BPTC. By the time we were half way through the course, most people had everything on that list and more. The reasons for this state of affairs and the fact that pupillage is competitive are not what matters here – what matters is being aware of the reality you are actually facing. In the time between submitting your applications and getting interviews, you should make sure you have something NEW to talk about on your CV. Examples include taking on a new FRU case or drafting a paper that has been submitted for publication. This is just one way to raise your game at interview stage. If you have these things on your CV, start drafting your application form. If you don’t have these things on your CV and there’s no more time to fix it, just work with what you have and decide how to address those gaps in a positive way. If you don’t have these things on your CV and you have time to remedy this before the next pupillage application round, well… what are you still doing here? Get on with it! Better to know what you’re up against and to be realistic about your chances than to feel bitterly disappointed when it later becomes clear why you didn’t succeed. The rest of the knowledge you will need is on how to apply. That’s what this guide is for. Knowledge is power. Wait, should Key #1 be power?